Unlike iPhone, which pretty much has standard design and potential customers just need to decide between which generation of iPhone and the storage capacity, Android customers are in to be spoilt for choices. There are many manufacturers for Android-based devices, and most importantly, the Android phone comes in many designs, colors, functions and specifications. Even the Android OS that powers the phone can be of different versions. Google, the developer behind the Android mobile operating system, has launched a Google Phone Gallery which showcasing the Android-based smartphones which available in the market for various countries. The Google Phone Gallery is the successor to Google Nexus One webstore which does not hit the market by storm, although the phone has been continue to be popular with Android developers. In its place is a gallery of all Android smartphone that currently available in the market through various mobile carriers or mobile service providers. According to Google Mobile blog, Google Phone Gallery intends to make the process to select Android phone a little easier for people who are in the market for a new one. 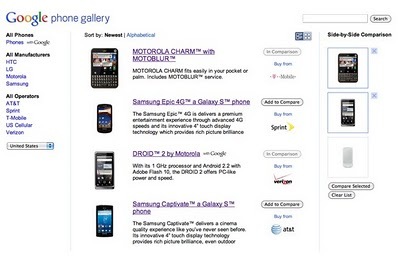 The Google Phone Gallery is officially launched on September 29, 2010. All the phones listed in the Google Phone Gallery include Android Market, Google Search, and other Google Mobile services such as Gmail, Maps, and YouTube, although there are phones that marked with “with Google” label to indicate that the phone has been optimized for use of Google Mobile services, such as providing easy access to Search, Voice Search, Google Talk, Google Maps, Gmail, Sync, Youtube and Android Market. In Google Phone Gallery, user can filter phones by country, manufacturer, and carrier. User can also view and compare images, technical specifications and features; and find where each phone is available for sale. In addition, user can select up to three phones for side-by-side comparison, sort by newest phone introduced or by alphabetically. Currently, Android phones from four manufacturers are listed on the gallery, including HTC, LG, Motorola and Samsung, while 35 operators from 16 countries are listed as where the phone can be purchased. With the increasing popularity of Android platform, the Google Phone Gallery is likely to expand its database of phone very fast.